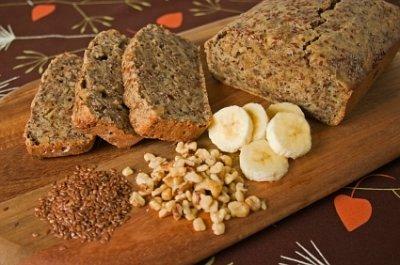 Eggless banana bread with flax and walnuts. Baking can often prove to be a challenge for vegans, but eggless banana bread is a simple comfort food that can easily be enjoyed on any diet. There are several different foods that can be substituted for eggs in quick bread recipes, including banana bread. If you're vegan, you know that replacing the eggs in baking can be extremely challenging. Many aspects of your finished recipe can be altered depending on which product you choose, including taste, texture, and rise. Simply eliminating eggs is almost never an option, since the resulting baked goods can turn out flat and hard. Eggs contribute many factors in baking. They act as a binding agent to hold the ingredients together, and they also contribute to the light and fluffy texture of cakes, muffins, and quick breads. Therefore, any substitute ingredients in vegan baking must provide the same or similar qualities. When attempting to replicate a traditional recipe that contains animal products such as eggs, butter, and milk, vegetarians and vegans usually end up having to experiment. Trying a variety of different substitutes and recipe tweaks is really the only way to create a recipe that will appeal to your own specific tastes. If the recipe you're basing your banana bread on includes butter and milk, you can use vegan margarine and soy milk instead. For a buttermilk substitute, try adding a teaspoon of cider vinegar to one cup of soy milk. Mix and allow to stand for several minutes before using. One other thing to keep in mind is that you may have to adjust your baking time and/or temperature, depending on which substitutes you use. Bake your banana bread for the shortest time recommended in the recipe, and check to make sure it's done. If the bread isn't quite finished, put it back in the oven, checking every five minutes or so until done. There are many different eggless banana bread recipes to be found online, and each one differs in taste and texture, as well as ease of preparation. Ingredient lists vary widely, so choose on that uses familiar ingredients that you're likely to have on hand. Fat Free Banana Bread - Uses a combination of baking powder and baking soda for leavening. Mom's Banana Bread Made Vegan - Uses egg substitute or flax seed meal, as well as butter substitute. Brilliant and Vegan Banana Bread - Uses tofu, flax, and agave nectar. Tried and True Banana Bread Recipe - Offers both vegetarian and vegan versions, using cornstarch, oil, and lemon juice. Cherry-Walnut Banana Bread - A tasty vegan twist on the classic. You can also make muffins using your eggless banana bread recipe. Simple make the batter as directed, and pour into greased muffin pans. Bake at the same temperature you would for the loaf, but deduct about ten minutes from the baking time, and check to see if it's done.